Rolling Stripe Hat is rated 3.8 out of 5 by 4. Rated 2 out of 5 by Kepa from Very bad material I'm not sure how the one purchased by the 5-star-reviewer is holding up. Mine is just subpar. I went through the trouble to create an online account here just to write the review. I bought one of these in the 'Azurite' colour at a ski resort that I went to before Christmas ('m not going back there soon so good luck to me in returning it). It's been less than two months and I have NOT been wearing the hat day-in-day-out, I might have worn it for 25 days tops, and a lot of those days would be for 10 -15 minutes only (before the car warms up when I went to work and left work). The hat is now full of pilling (those little wool balls), no kidding, it looks and feels terrible (see attached picture). I don't remember any of my clothing items being this bad, only from at least 20 years ago when pilling was common and people lived with it. 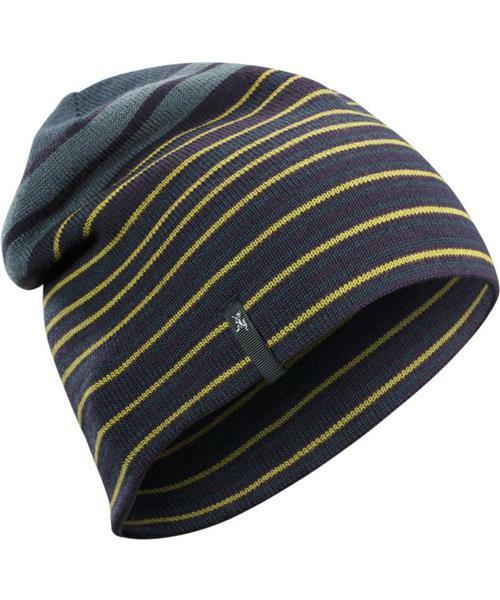 I own another Arc’teryx Toque (looks like the current Bird Head Toque) that I bought a few years ago and it still looks new, and it’s gone through numerous washing-drying cycles and some rough uses. So I don't know what happened to this product (which I haven’t been brave enough to wash it yet because I don’t know what it will look like after the wash). I give it 2 stars instead of one only because it did look and feel great for a few days. If Arc’teryx truly stands behind their product, they simply should not be selling this anymore, because one look at my hat, any reasonable person who never bought any Arcteryx items before, will definitely stay away. Rated 3 out of 5 by Carl from Old version was better Nice, warm toque. I prefer the old version, it was a little longer and warmer. Rated 5 out of 5 by Bretty from Great hat for cool weather I wear this hat from 35-55 degrees Fahrenheit. I have a larger sized head and it still fits me well. It is extremely comfortable and has a lot of stretch to it. Some very cool colors offered. Colors on my hat are just as bright as in image and have maintained brightness over time. My favorite cold-weather hat I own. Rated 5 out of 5 by toomanybikes from great all-round toque Got a couple of this toques, they fit my larger head. I like they are reversible. Just the right warmth for active or casual use.